Perspectives on Our Struggle with Sin presents in point-counterpoint form three differing views of a Christian’s relationship with the law, flesh, and spirit as illustrated through Paul’s often-debated words in Romans 7. 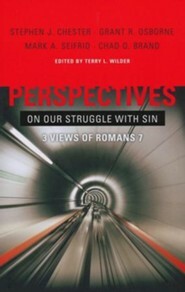 Stephen Chester (North Park Theological Seminary) writes “The Retrospective View of Romans 7: Paul’s Past in Present Perspective,” suggesting the apostle’s description of his struggle speaks more to his pre-Christian self. Grant Osborne (Trinity Evangelical Divinity School) offers “The Flesh Without the Spirit: Romans 7 and Christian Experience,” perceiving Romans 7 as an accurate representation of what believers go through even after their conversion. Chad Owen Brand (The Southern Baptist Theological Seminary) writes a conclusion on the theological and pastoral implications of Romans 7. "One difficult and disputed text, three fine scholars, and three views of the passage. How is one to read Romans 7? This book takes you through all the options and rationale with detail, charity, and clarity. This is how to have a discussion over a disputed text. Read and learn about Romans 7. Decide who is right and why. And, above all, learn about how to discuss a difficult text." "The meaning of Romans 7 continues to bedevil and puzzle readers. This volume does not simply rehearse arguments and positions from the past. The authors approach the text from fresh and illuminating perspectives, and hence this work represents a significant contribution to scholarship." Terry L. Wilder is professor and Wesley Harrison chair of New Testament at Southwestern Baptist Theological Seminary in Fort Worth, Texas. Chad Brand is associate professor of Christian Theology at Boyce<?xml:namespace prefix = o ns = "urn:schemas-microsoft-com:office:office" /> College of the Southern Baptist Theological Seminary in <?xml:namespace prefix = st1 ns = "urn:schemas-microsoft-com:office:smarttags" />Louisville, Kentucky. I'm the author/artist and I want to review Perspectives on Our Struggle with Sin: Three Views of Romans 7 - eBook.